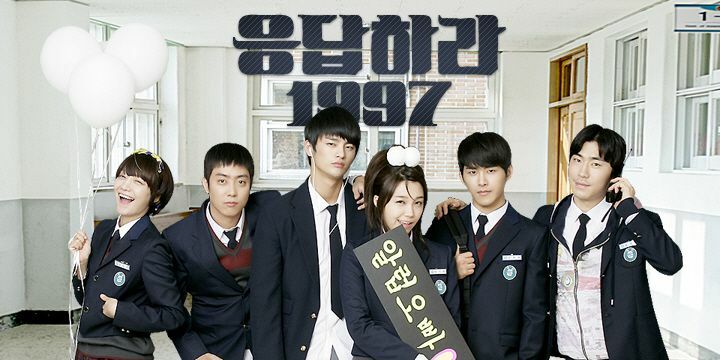 I finally started watching one of the most raved dramas this season, Reply 1997! 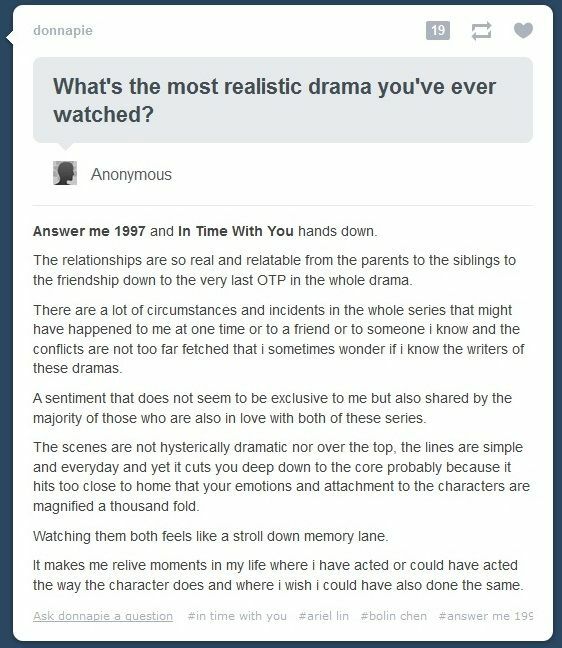 This was recommended to me by my friend, Sheirmane, who always comes first when it comes to dramas. She also recommended me some of the dramas that are now included in my top list, such as Personal Taste, 49 Days, Secret Garden and Dream High.I know I am not the best drama reviewer there is and I am nowhere close to the reviewers from Dramabeans.com, but let me write a short blog post about what I think of the drama Reply 1997. Forgive me for saying this shallow reason but first thing I look for in a drama is the actors in it. When I heard about this drama, I didn't know who the actors were so I was a bit skeptical. I like the idea of a flash-back drama concept. I wasn't so much aware of my life back in 1997, I was 11 years old then. But I liked that generation of wide bottom pants, middle-parted hair, cute boy bands, Tamagochi, cassette tapes and beepers and pages! Those things were so cool and then and it's good to see those stuff on TV again. There's something about that simpler life then than makes it so fun! I like that the story revolves around the time of high-school! I don't know about you guys but there's also something about high-school that makes it so memorable for all of us. The world seems so big for us at that time, and that's also the point where most of us experience our first love. The characters found love in high-school, how sweet! I like that the story is really light and bubbly. Because admit it or not, we don't always want to torture ourselves watching draggy heavy dramas, do we? It's like listening to a friend's life story. Reveling the story through flashbacks was also such a nice twist! It's like having an appetizer when you eat and then have the other dishes served one at a time. It makes you crave for more while still having ample time to savor what you have at the moment. Shin So Yool was the better actress in the drama. Her cuteness was adorable. She also made me cry in episode 13 when her father passed away and she shared some stories about him. Seo In Gook's acting was really very impressive. 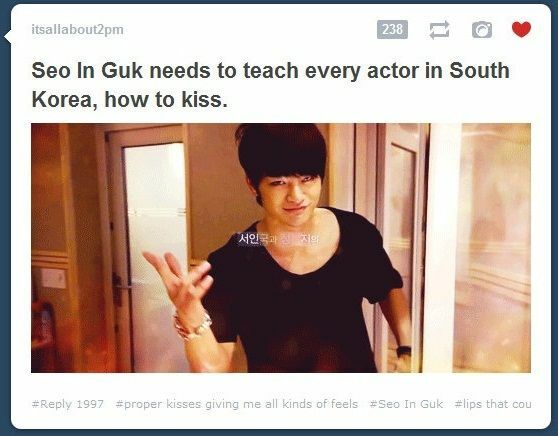 He was able to convey his feelings and he acts so naturally. He is a high-school boy in 1997 and then a respectable lawyer in 2005! So amazing, In Gook! Thumbs up! Also, he is really handsome! It's hard to believe he came from a poor household. Perfect height, small face, small yet alluring eyes, a good singing voice and acting skill to go with all of that! One more thing I like about this drama is that everything is so realistic! From the character's house, status, outfit, relationship, dialogues and everything! Some dramas get too cheesy and over-the-top with the usual poor-girl-meets-rich-and-handsome-man story. I saw this post on Tumbr and I just feel the need to share it here, too! 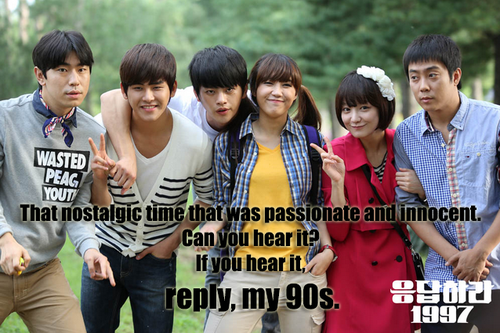 Finally, I like all the kissing scenes in Reply 1997! Thankfully, it was shown on a cable channel, therefore not too much restrictions were implemented! Of course, couples kiss in real-life! Some dramas only show the couples peck on the cheek or a lip smack, and some dramas don't even have a kissing scene at all! Seriously, what is that? I really loved Bae Suzy in the drama Dream High 1. Her rough attitude there was bearable...but in this drama, Seong Si Won was NOT. I mean, she pushes around a guy just like that? A tall, smart and handsome guy like that? And he just obeys and lets her? I don't think so. There's something about tough girls that make them cute, like female characters from Meteor Garden/Boys over Flowers, Secret Garden and Dream High 1. But there's a thin line between being cute-sy and trying too hard. I know Eun Ji is a singer and not an actress but I feel like her acting could still be improved. Each time the scene calls for a dramatic emotion, the camera focuses on her and her face seems rather blank and she was not able to express her character's emotion successfully. But she's getting there, just some more practice please. Have you guys also noticed how the main character looks a bit like IU? Or is it just me being confused between two Korean women's face? When Si Won's fathers was admitted to the hospital, she rushed there crying and saying sorry to him, but right after that, she goes around being concerned about a boy band? Okay, writers, we get the point that she likes that group to death, but couldn't you at least make her visit her father just once? Or was it you guys trying to tell us that she's really a stubborn daughter like that? I was shocked to know that In Gook and Ji Won are singers in real life: more shocked when I found that In Gook won Superstar K 1 and the latter is actually the leader of Siech Kies! I noticed that there were some irrelevant scenes in this drama. Like a scene with too much conversation that doesn't have anything to do with the whole story... And the ending went too fast! I was forcing myself to digest each scenes and each revelation as they all went by too fast! I feel as if the writers were on a hurry to finish if. The last 2 episodes could still be stretched into 4 or 5 more or they could've settled for a 20-episode drama. It was really good how the ending was unpredictable. You will never guess if SiWon ended up marrying Yoon Jae or Tae Woong, because they make the scenes so confusing. I mean, yes Yoon Jae and Si Won are the main characters so it's only logical to make them end up together, But then again, this is Korean drama. Koreans are so good at making dramas that they have the power to twist a story just like that! Anyway, I liked the ending. I like drama endings that are light and make viewers feel good. Their final scene was a flashback of their high-school Fall picnic in 1997. 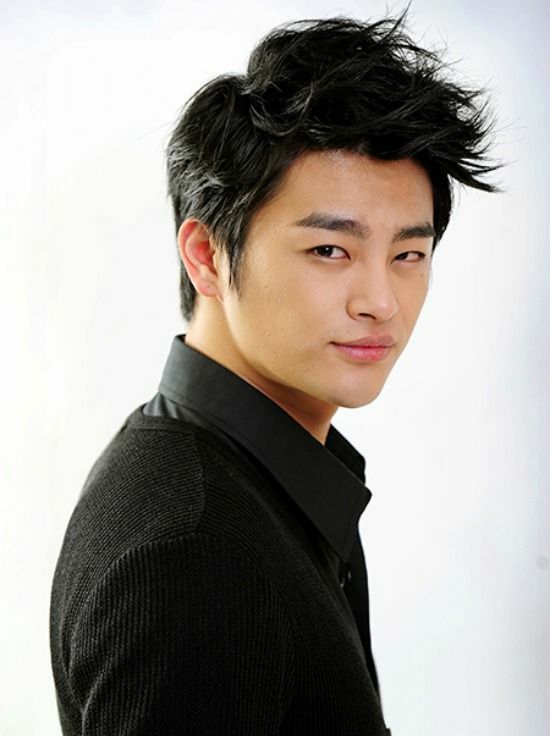 So that answers why Yoon Jae was at the hospital with broken arm. Now that I have finished watching this drama, I finally came to understand why my friend kept on insisting me that I should go see this drama. It's because she knew me so well that she was so sure I was going to fall in love with it, and I did! I want to commend TvN for this very good drama. Though they referred to this as a sitcom because of the number of episodes...it was still all good. Good job to the writer, director, staff and crew and to the talent coordinator! You guys did a good job on choosing each and every actor in the drama. It wouldn't have been this successful if not for the actor's contribution and fine acting skills! Thank you for giving us that nostalgic feeling of going back to our 1990's. It sure was a fun and memorable decade! We will remember and fall in love with this drama for quite a long time, that's for sure.